The government has said electricity costs will rise due to its policies. In its annual energy statement, the Department of Energy and Climate Change said government policies would increase the cost of electricity by 27% by 2020. This could push up the cost an average bill by almost £280. However, the department said that its policies on energy-efficient products, smart meters and home insulation would more than compensate - leaving the average household £94 better off. 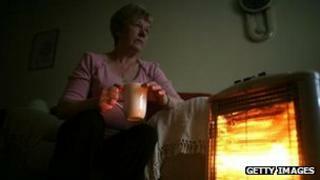 The government also launched a consultation on its Green Deal programme to promote energy efficiency. The scheme is designed to encourage consumers to take out loans to help make their homes more energy efficient, thereby reducing their energy bills. The programme will include support for poorer households and difficult to insulate homes and will replace current schemes. "The decisions we make will ensure that the consumer is protected as far as possible from rising prices," said Energy and Climate Change Secretary Chris Huhne. But, speaking in the House of Commons, Mr Huhne accepted that most bills would still rise overall, because of rising gas prices. However, he claimed the actual impact of the government's policies would leave consumers 7% better off. Increases in the cost of electricity to fund renewable energy and other measures would be balanced by improvements in domestic energy efficiency, he claimed. But the opposition said it wasn't clear whether that would happen. "The government's flagship energy efficiency programme, the Green Deal, has been delayed and is in chaos," said Caroline Flint, shadow energy and climate change secretary. Policies driving up bills include payments towards support for the fuel poor, the cost of carbon and renewable energy. Offshore wind and other large renewable projects are expected to make up, on average, £48 of a household bill. Solar and other smaller schemes come in at about £6. A significant portion of the government's anticipated reduction in consumer bills comes from its products policy. Mandatory efficiency standards on new products are expected to save the average household £154 a year, with loans obtained through the Green Deal saving another £53.